HILLSBORO – Friday's Meriwether National Cross Country Classic was a good opportunity for Newberg High School to put up some fast times and measure itself against the rest of the Pacific Conference. Following a 14th-place showing by the boys and a 22nd-place finish by the girls, coach Bruce Sinkbeil said he was pleased to see that the Tigers pretty much did both at Meriwether National Golf Course. "It's like a really good mid-term exam so you can see where you're at with the rest of the league," Sinkbeil said. "But everybody is going to be different by the end of the year, including us. It's a good chance to run quick, but when you have that many kids in a race, it can also be hard to run fast because there's somebody around you all the time and you really have to watch where you're going." 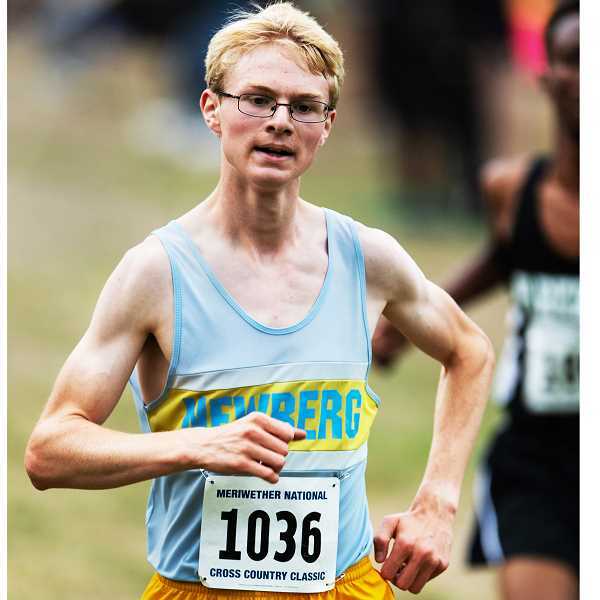 Sophomore Jonathan Rolfe paced Newberg in the boys event, dropping more than 30 seconds from his previous career best to cross in 16:37.7 and place 24th individually in a race featuring in excess of 300 participants. He was also fifth individually among Pacific Conference runners. "That was pretty big for him," Sinkbeil said. "It didn't surprise me -- I knew he'd get under 17:00 -- but that's pretty significant for him." Also setting new PRs were junior Sam Mock, who was 69th in 17:11, and sophomore Asher Tatsumi, who posted a time of 17:51.9 to place 128th and finish as Newberg's fourth runner. "That's a pretty significant breakthrough for him, too, and it was Asher's first time under 18:00" Sinkbeil said of Mock. "They had a good meet and were pretty excited after that." Seniors James Busch and Hunter Bensman were third and fifth for the Tigers, respectively, in 17:35 and 17:54, but did not have strong races, so Sinkbeil is excited about the team's potential if the Tigers can get all five rolling in the same race. Among league teams, Sherwood was sixth with 197 points, followed by McMinnville in ninth (323) and Forest Grove in 12th (387). If that form holds, it could be an interesting three-way battle for the league's second and third qualifying spots for the state meet. "If I score it like a district meet and just take everybody else out, Mac, Forest Grove and us are really close," Sinkbeil said. "That's pretty good and it's without James or Hunter really running what they can run." The Tiger girls were paced by junior Abigail Hein, who posted her best time of the season so far at 20:17.6 to place 46th overall. Newberg (502) was fifth among Pacific Conference teams, just behind Century (495). "They're going to have to be a bit patient, but I think they're going to come around," Sinkbeil said of the girls team. "They're a little bit banged up but are in the mix league wise. The next month or so will be pretty important for them." Rachel Sherwood, Macy Showalter and Sophia Redwine ran in a tight pack and finished one after the other in 119th, 120th and 121st, with Bailey Sherwood just behind in 130th. Sherwood posted a time of 21:55 with Showalter and Redwine one second back in 21:56, which was a PR for the freshman Redwine. "She's been a pretty good addition," Sinkbeil said. "With younger runners, you never know, they might bust out something that you don't expect. They're more unpredictable that way, but she's been a big positive." The Tigers will travel to Glencoe on Wednesday for their first league meet versus the Crimson Tide and McMinnville, then will host Sherwood and Forest Grove Oct. 3. That will be the only home meet of the season and the Newberg Boosters are hosting a bonfire after the races as a kickoff to homecoming week. Those participating in the bonfire are encouraged to come out early and support the Tigers, who will also honor their seniors. "It's pretty cool that our home meet just happened to fall during homecoming week," Sinkbeil said. "Sherwood has good teams and Forest Grove does, too, so hopefully we'll use that to our advantage, a little extra fire. Our kids usually run pretty well on our home course. They get excited. That will add a little bit of juice for them, I hope."